While North Korea prepares a big show to mark the 70th anniversary of the ruling Workers’ Party, the daily struggles of life outside the capital –such as finding clean running water and putting nutritious food on the table year-round– pose a harsh, but largely unseen, contrast to the grand celebrations the world will see Oct. 10. To make sure Pyongyang looks its best, extensive construction projects have considerably prettied up the capital, which is far and away the most developed city in North Korea and is even relatively comfortable for the increasingly affluent segment of its populace. But life in the provinces, and particularly in rural areas, is quite a different story. 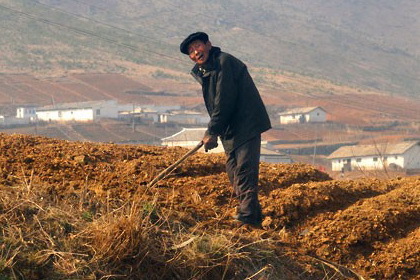 Instead of the new high-rise apartments and bicycle lanes that have been put up in Pyongyang for the party anniversary, the people in the communities of Sinyang County, which is just 150 kilometers (100 miles) from Pyongyang (takes three hours to reach by car on mostly unpaved roads), are just now just beginning to enjoy a far more fundamental improvement in their lives …”disease-free” running water. Elsewhere, an old woman sits outside her home scraping corn off recently harvested cobs. The dry corn will be ground into flour to make food. 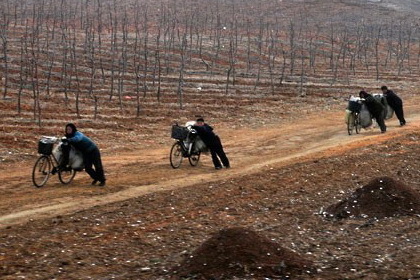 In the North Korean countryside, this is a common sight. Everything must be done by hand, from the fields to the home.